The duo Danilo Blanco and Fernando Zelman of Galeria Central, in a partnership with Galeria Pontes and Cine Olido, present the “Circuito SP de Moda e Arte” (São Paulo Fashion and Art Circuit), that will occur parallel to the Spring/Summer 2011 Fashion Week, supported by the São Paulo Fashion Week, bringing together the 2nd edition of the “Fashion Film” Show at Olido, and the exhibit “Sunday Outfits in Popular Art” at Galeria Pontes. Complementing the creative workshops at Galeria Pontes and the dynamic chat with the curators of Fashion Film, the proposal includes – at the Olido Cinema – comments by the critic Luciano Ramos when presenting the films in the exhibit and the “Solidary Style” by Manu Carvalho, who reveals precious style hints, assembling fashion looks with clothes and accessories found in permanent bazaars at São Paulo charities, such as AACD, GRAACC, APAE, Casa Hope and the Salvation Army. Production: Galeria Central, Cine Olido and Galeria Pontes. 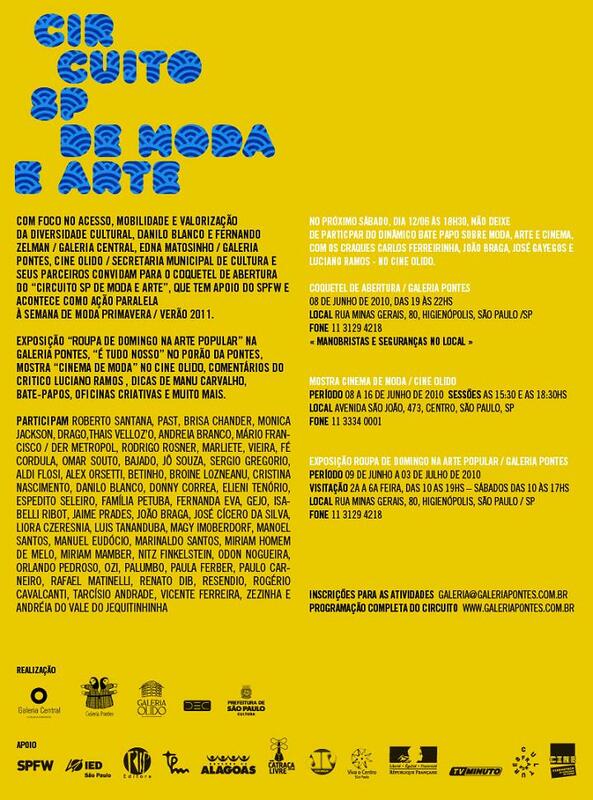 Supporting Agencies: SPFW – São Paulo Fashion Week, Secretaria Municipal de Cultura, Prefeitura de São Paulo, Editora Trip, Revista TPM, Sagatiba, Galeria Karandash, SEBRAE-PE, the Alagoas State Government, Sobrado 7, Catraca Livre, Rádio Jovem Pan, Associação Viva O Centro, the French General Consulate and TVMinuto. Idealized by Danilo Blanco e Fernando Zelman from Galeria Central, “Sunday Outfits” stimulates movement, fusion and convergence of fashion culture with several genres of expression, involving emerging talents and consecrated names, through the renewal, itinerancy and mobility of twelve editions. For this 8th edition, executed in partnership with Edna Matosinho de Pontes from Galeria Pontes, the exhibit reinvents itself when inviting Popular Art artists to provide their interpretation of the theme “Sunday Outfits”, showing works of artists from several states, such as Paraíba, Alagoas, Minas Gerais, Pernambuco and São Paulo; bringing together stylists, painters, photographers, designers and others. Place: Galeria Pontes – Rua Minas Gerais, 80, Higienópolis, São Paulo/SP – Phone number (11) 3129-4218. Access to people with special needs. Opening cocktail: June 8, from 7 to 10 P.M.. Parking and security personnel on the location. Visitation: June 9 through July 3, 2010. Monday through Friday, 10 A.M. to 7 P.M. – Saturdays from 10 A.M. to 5 P.M..
Chat with the artists: Jaime Prades, Oz and Gejo. June 18, June 25 and July 2 (Fridays), from 7 to 10 P.M..
Creative workshops: Participants – Gejo and Sérgio Gregório. June 26 and July 3 (Saturdays), from 2 to 5PM. Round table / Sagatiba – “Film, Fashion and Art – Boundaries and Connections”, with the speakers: Daniela Capelatto, filmmaker; João Braga, professor e fashion historian; and Priscila Brunetti, fashion consultant. June 29 (Tuesday), 8 P.M..
Curatorship: Danilo Blanco, Edna Matosinho de Pontes and Fernando Zelman. Focused on access and mobility of contemporary artistic production, the Gallery launches its new space for exhibition – THE PONTES BASEMENT – presenting paintings, photography, sculpture, assemblages, urban art, illustrations and several others, bringing together consecrated names, juvenile protagonists and emerging talents from the academic environment, coordinated by Danilo Blanco and Fernando Zelman. Mixing expression genres, the Pontes Basement is inaugurated with the show “IT IS ALL OURS”, presenting works of Gejo, Jaime Prades, Isabele Ribot, Drago, Mário Francisco/ Der Metropol, Liana Keller, Magy Imoberdorf, Mônica Jackson, Roberto Santana, Rodrigo Rosner, Rogério Cavalcanti, Thais Velloz’o and many others. Galeria Central is a dynamic laboratory of creative ideas, directing its actions to the production, diffusion and democratization of the access to art and contemporary culture, sinergically involving urban juvenile protagonists, new talents from the academic environment and consecrated names, with an emphasis on the mixture of expression genres. 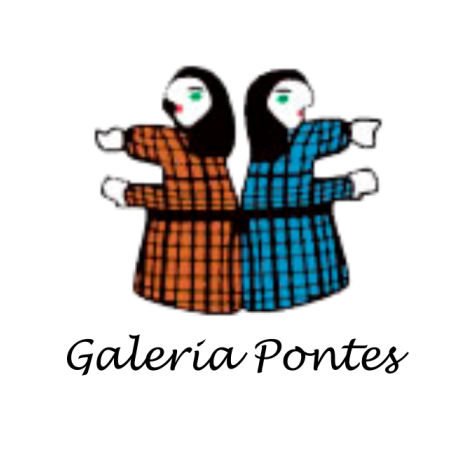 “Galeria Pontes is exclusively dedicated to popular art. It is the result of the loving sunny outlook of Edna Matosinho de Pontes, who travelled all over Brazil in search of pieces that inventively expressed the magic of Brazilian people and the force of our nature. When choosing artists and pieces, Edna let herself be guided by passion, but always sought for the horizons of authentic creativity. Thus, with patience and the necessary obstinacy, Edna Matosinho de Pontes amassed a rich and diversified collection. The works come from several very distant Brazilian regions – they were made in the Amazon forest, in the Mato Grosso swampland, in the Goiás thickets, in the Jequitinhonha valley, in Minas Gerais, in the Pernambuco hinterland, summing up the local wide world they came from. The ensemble forms a landscape of the Brazilian soul, presenting a country dreamt of by its people, with exuberance, mysticism and sensuality.